In the heavens above us, a full lunar eclipse and a solar eclipse occurred this month. 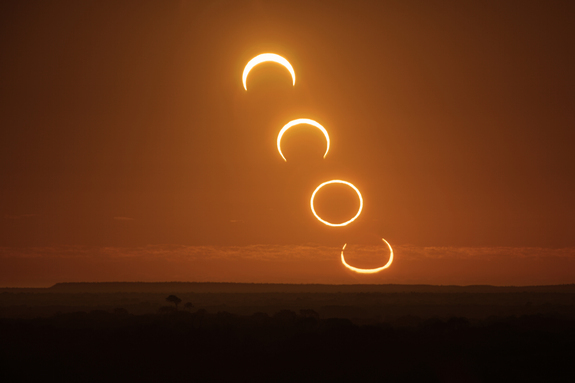 I share Jia Hao’s images of this week’s solar eclipse above (link to more eclipse info). What a bizarre and amazing sight to see our sun temporarily snuffed out by the shadow of our moon! My astrologer friends tell me that eclipses intensify and stir up whatever is going on in our lives here on planet Earth. Some believe that eclipses bring up our subconscious shadow selves to be healed. But the Cardinal Grand Cross that formed in our sky a week ago is even more unusual than an eclipse. This huge planetary cross was created by Jupiter, Pluto, Mars and Uranus; 4 planets actually lined up in a perfect cross formation in our sky this month. You can bet that I sat up and paid attention when I heard that this cross was slowly forming in our skies and would be perfectly aligned on April 23, my birthday. Yikes! I don’t know about you, but it has definitely been a month of shakeup and shifts for me and my entire family; we moved into a new home, lived through huge job shifts, a delay in the release of my book, and weird illnesses with odd body symptoms that hang on and on… There have been so many unusual events happening in my neck of the woods that I can’t help but shake my head in wonder. And the world around me seems all stirred up too. I have been engulfed and surrounded by chaos and shakeup all month. It seems funny now that I never paid much attention to astrology (or astronomy) when I was in my 20’s and 30’s. Back then I would read my horoscope for laughs, but the movements of the planets just didn’t seem that important to me. But over time, I’ve come to realize that the workings of the sun, moon and planets actually do have an effect on my life; I’ve experienced so many instances of shifts in my life lining up with shifts in the heavens that defied the odds of chance. And as I watch the heavens this month, the synchronicity between my life and the cyclic movements in the sky above me just gets more and more obvious. My Celtic ancestors would laugh at how long it has taken me to accept the idea that I might actually be affected by what’s happening in the heavens. The Celts believed in the spiritual principle of “as above, so below”; what happens in the heavens is synchronized with what happens on planet Earth. The Celts actually studied how the movements in their sky affected and interacted with events on Earth. They used the synchronicity between heaven and Earth to inform and guide their lives. I wonder why this synchrony between heaven and Earth is such a strange and foreign idea for us today? When did we lose this knowing and why? Quantum physicists have shown that just the act of observing the inner workings of atomic particles changes the behavior of those particles. Maybe it’s not so weird and far fetched to believe that the movements of huge planets around our sun actually affect and interact with all life on Earth. Maybe, just maybe my Celtic ancestors were onto something important. Share the post "Synchronicity Above and Below"